This section of the Website focuses on Hawthorne's life up until his graduation from Bowdoin College in 1825. Nathaniel Hawthorne was born on July 4, 1804 in Salem, Massachusetts to Nathaniel Hathorne and Elizabeth Clarke Manning Hathorne at 27 Union St. Less than four years later, in the winter of 1808, Hawthorne's father, a ship captain, died of yellow fever at sea, off Surinam. In 1809 Hawthorne, his mother, and sisters moved a block away to the Manning house on Herbert St. (now 10 ½; some sources list 12 Herbert St. which does not currently exist but may have in Hawthorne's time); there Hawthorne shared a room with his Manning uncles on the third floor. Hawthorne spent much of his youth in this house and referred to it as "Castle Dismal." When he was almost six, Hawthorne was instructed by Francis Moore in a schoolhouse on Herbert St. that had opened in 1810. Moore left Salem in 1812 after receiving his M.D. 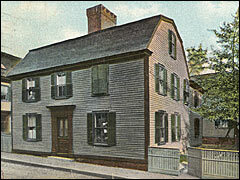 from Harvard, and Hawthorne's schooling was continued by Joseph Emerson Worcestor in a building near where the Andrew-Safford house was built in 1818. Hawthorne attended Worcestor's school until November, 1813 when he was injured while playing ball. Although the extent of the injury is unclear, Hawthorne had a long convalescence. In fact, it was only with the intervention of his mother and his Uncle Robert that he left his bed after several months and began walking on crutches. Hawthorne's mother believed her son's eventual recovery was the result of a cold water cure advocated by Dr. Smith of Hanover, New Hampshire, which entailed pouring cold water over the foot every morning. Whatever the reason for his recovery, it was not a smooth one. Hawthorne relapsed at one point and returned to using crutches. The reasons for the lengthy convalescence may be psychological, rooted in the memory of his father's death as well as of the deaths of his Manning grandmother. It was during this period that Hawthorne became a voracious reader, and he was instructed at home by Joseph Worcester. Hawthorne also spent idyllic days in Maine in his youth, however. Dr. Melinda Ponder says that letters to Robert Manning, Hawthorne's uncle, suggest that Hawthorne and his family may have spent time in 1810 visiting Raymond, Maine, near Sebago Lake. Hawthorne was still convalescing in 1816 when his family began to spend considerable time in Raymond, Maine, first visiting Hawthorne's mother's brother, Richard Manning, who had a house there, and later in the house Richard built for his sister next to his own. (This house was purchased in 1922 by the Hawthorne Community Association, and they remain the caretakers.) A visitor to this house today can see the crutches which Hawthorne used while living there. In 1816 Hawthorne returned to Salem, on the request of his Uncle Robert. Hawthorne's mother and sisters remained in Raymond, however. In 1818 Hawthorne once again moved to Maine to attend boarding school in Stroudwater, near Portland. In February of 1819, he returned to Raymond, cutting short his term by six weeks, and in November of 1819, he returned to Salem where he attended Samuel Archer's school in preparation for college. Between late August and late September of 1820, Hawthorne and his sister, Louisa, published seven issues of The Spectator, a witty imitation of the Salem Gazette containing short literary pieces, news, and advertisements, and circulated it to members of the family. Although revealing Hawthorne's comic side, pieces in The Spectator often focused on death, perhaps another indication, along with Hawthorne's self-imposed long convalescence from his injury as a youth, of a deep pain from the loss of his father. Also beginning in 1820, Hawthorne received tutoring from Benjamin Oliver in Salem. The following August, Hawthorne left for Bowdoin College in Brunswick, Maine. He never went back to Raymond, even on vacations from Bowdoin, since his mother had moved back to Salem in 1822. The Bowdoin Hawthorne attended had only three buildings: Maine Hall, Massachusetts Hall, and the chapel. There were 38 freshmen and five faculty members when Hawthorne matriculated. The curriculum focussed on the classics and on religion, not surprising as most colleges in America were originally created to educate ministers. Hawthorne's roommate for his freshman and sophomore year was Alfred Mason, son of a prominent Portsmouth, N.H. attorney. Mason's affluence contrasted with Hawthorne's meagre allowance from his Uncle Robert, and Hawthorne frequently wrote letters to his family that had the message, "send money." Despite being seemingly always short of funds, however, Hawthorne led an active social life. Alfred Mason introduced him to Horatio Bridge, and he also met Henry Wadsworth Longfellow, Jonathan Cilley, and Franklin Pierce. Horatio Bridge and Franklin Pierce became close and lifelong friends. It was with these friends that Hawthorne gambled, drank at Ward's Tavern, smoked, and violated other college rules, sometimes getting caught and fined. The Peabody Essex Museum has a letter from Hawthorne to his mother in which he announces , "If I am again detected I shall have the honour of being suspended." Hawthorne did manage to avoid suspension, however, and graduated on September 7, 1825.